Amazon made some pretty big waves last year when it released its Kindle Fire Tablet. Its estimated that they sold 4.7 million of them in Q4 last year, making it the most popular Android tablet on the market. 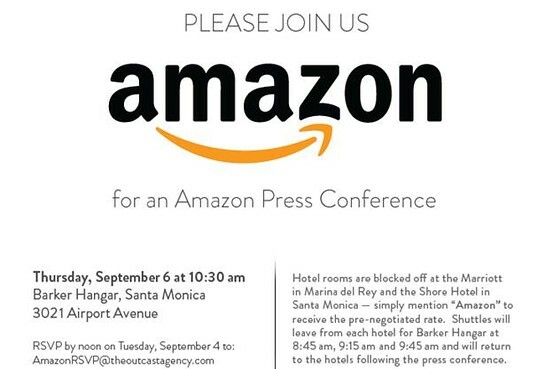 Amazon sent out press invites today for an event its holding on September 6th. Although mum is the word on what they are announcing, based on the fact that some Android specific sites received the invite, its safe to say its going to be a new Amazon tablet. Many observers have speculated that one of the main drivers behind Apple’s decision to launch the iPad Mini was to combat competition from 7-inch tablets like Amazon’s Kindle Fire. With a slim form factor, low price-point, and attractive range of eBooks and apps the Kindle Fire proved to be the unexpected tablet success of 2012. No word on specs or price for the new Kindle Fire at this point, but given the competition of Google’s Nexus 7 and the Barnes and Noble Nook Tablet, something tells us this is going to be something special. Time will tell though so save the date. We’ll have full coverage of whatever comes out of the press event here at Tapscape.